The book of Zechariah is the eleventh out of the 12 Minor Prophets, and by far the longest out of them, detailing the prophecies and ministry of the prophet Zechariah. It is not an easy read – filled to the brim with apocalyptic literature and Messianic prophecies. And I personally think that prophetic verses are the hardest to understand. Zechariah emerged as a prophet and prophesied to the Jews in Judah and Jerusalem along with Haggai many years after the fall of Jerusalem [Ezra 5:1] – the Babylonians have been taken over by the Persians, and Darius was in power [Zech 1:1]. He spoke a lot about the historical context of the Israelites, and how their fathers have turned away from the Lord and earned the wrath of God, which accumulated and manifested in the fall of Jerusalem. The Persians were not as oppressive as the Babylonians, and Darius even decreed to allow the rebuilding of the temple [Ezra 6], which coincided with Zechariah‘s preaching to return to God. At this point the Jews had likely already, physically, turned back to God by returning to their land and renewed the building of the temple. 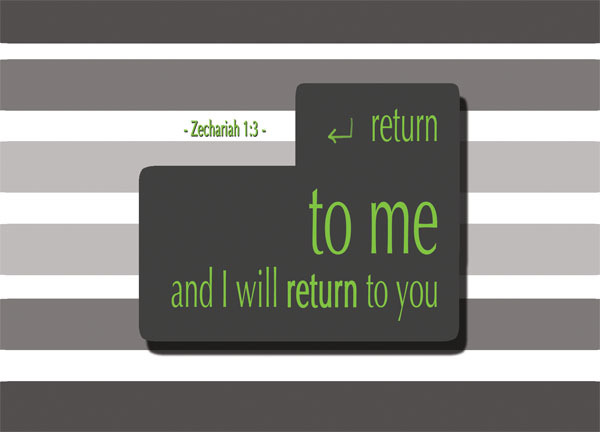 But Zechariah was not referring to a physical return, but something that is from the inside – a spiritual return to the Lord, by putting behind their evil ways and evil practices that their forefathers had already had [Zech 1:4]. God had given his people the power of freedom – they had chosen to leave, but they had the power to return to God as well, if they would just use it. When we repent, confess our sins, and turn back to God, we can truly dwell in Him. While God had returned his people from physical captivity, it was important as well that their hearts turn back to God, lest such misery and destruction befall on them again. The idea of returning is not new in the Bible – in fact, through the prophet Isaiah, God has repeatedly called for his people to return to him [Isa 31:6, 44:22]. This sentiment appears again in Malachi – Ever since the time of your forefathers you have turned away from my decrees and have not kept them. Return to me, and I will return to you,” says the LORD Almighty [Mal 3:7], and James draws on it as well – Come near to God and he will come near to you. Wash your hands, you sinners, and purify your hearts, you double-minded [James 4:8]. In Jeremiah the Lord is described as a spurned lover whom his people have cheated on, yet he yearns for their return – If a man divorces his wife and she leaves him and marries another man, should he return to her again? Would not the land be completely defiled? But you have lived as a prostitute with many lovers–would you now return to me?” declares the LORD [Jer 3:1]. All these serve to show that there is a place for the Jews in the Lord’s hearts, if only they would choose to return. Jesus spoke about this sentiment too through the parable of the lost son [Luke 15:11-31]. As the lost son, it is normal to worry if there is still a place for us at home. But God assured us through the prophets, that all it takes is for us to turn back to him. We will receive his grace and pardon, if we would just turn back to him. This is not so much a condition than it is a promise. He will return to the Jews, if they would return to him. He will pardon them with his grace and mercy, which he gives freely – but there is just one requirement – that they turn back to him. While this was meant for the Jews in that post-exilic context, it applies to us today as well, for this is about God‘s nature, and God‘s nature does not change [James 1:17]. It is notable that the term Lord Almighty appears three times in this verse alone – it appears for another 50 times in the rest of the book of Zechariah. It appeared regularly in the books of Isaiah, Jeremiah and Haggai as well. It is interesting when cross-referencing other versions of the Bible. KJV renders it as Lord of the hosts; NLT renders it as Lord of Heavens’ Armies – what exactly does it mean? Perhaps it implies the greatness of God and his omnipotence – the fact that he can do all things and his might is greater than the suffering of the Jews, and it was repeated again and again – the Lord Almighty says this, the Lord Almighty declares that – in a bid to remind the Jews that they have a powerful God who is there for them. Why are you not returning to draw strength from the great God of yours, who is awaiting for you? In a way it also inspires confidence in the Jews, as we should really expect that they were living in very harsh and oppressed times. I am honestly not familiar with the book of Zechariah – well, I’m unfamiliar with most of the minor prophets, but since Zechariah is by far the longest book amongst them, I’m far more unfamiliar with it. In fact, I seldom read it – I seldom find a need to do so. How often would you come across a pastor referencing the book of Zechariah anyway? But one day, I saw a verse tag scribbled somewhere that says (Zec 2:35) and it hit me hard. Not that I know what that verse is – there isn’t a Zechariah 2:35, I was just making it up (I forgot the exact verse) – but because it actually took me a while to register that it is a verse and not someone saying that they have an appointment with me at 2:35PM. My name is Zec, but it really has nothing to do with Zechariah. Still I was compelled to read it. Return to me and I will return to you – time and time again throughout the history of the Israelites we see them turning away from God, we see God‘s wrath striking against them, and time and time again we see God forgiving them when they cry out to him, he relents, he holds back his full wrath, and accepts them in his embrace again. It was so in the time of Moses. It was so in the time of David. It was so in the time of the judges and the prophets. It was so in the time of Jesus. It was so in the time of the apostles. It is so even today, albeit in a far smaller scale, in our personal lives. Although spoken by a deluded Eliphaz, this verse is not untrue – if you return to the Almighty, you will be restored: If you remove wickedness far from your tent [Job 22:23]- what’s untrue about this verse is merely the silly fact that Job simply has no wickedness in his tent. But the Israelites did. And we most likely do. Return to God, and God will return to us. Come near to God, and he will come near to us. It is a promise. All it takes is for us to turn back to him. Great synopsis of the Book of Zechariah! Then you close the synopsis beautifully by reiterating the book’s most important message, a message which is still valid today: Return to God and He will Return to You! The format that you follow for writing this blog would make a wonderful format for an “Overview of the Bible” textbook or study guide. Do you have plans for turning your blog’s content into a published book? Thank you for thinking so highly of this blog! But no, don’t intend to turn all these into a book. I’m surprised you asked, in fact. I merely want to study the Bible leisurely at a disciplined pace which this platform provides.